Lymington Cat and Kitten Rescue Centre is charity which provide a loving home for abandoned cats. The centre needed a dedicated website which promoted the work they do and also encouraged people to home one of the cats they take in. It was important to the animal rescue centre that the new website would be easy to navigate, clearly communicate the services of the organisation and enable the charity to edit and update content on the site themselves. 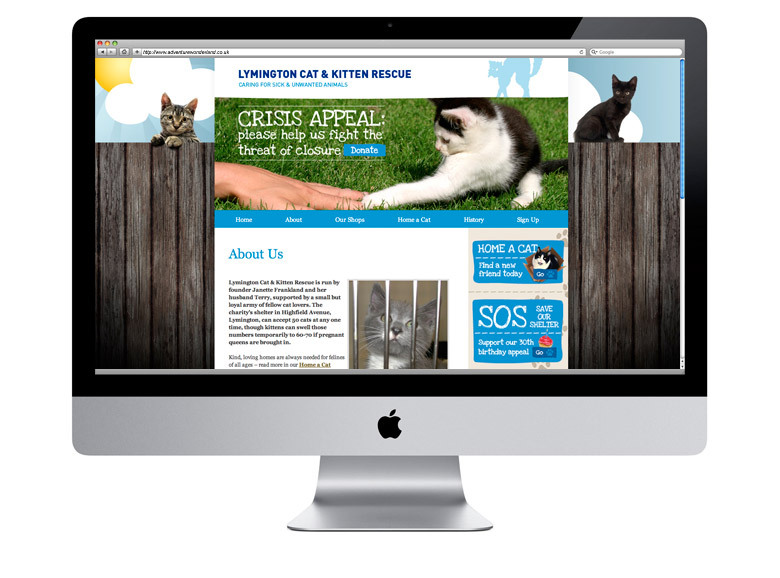 Delighted to help the cat and kitten rescue charity, CuCo designed and built the website for the charity using WordPress, the user-friendly CMS, which would allow them to edit and update the site themselves. In order to help more cats and kittens in need, the site also includes newsletter sign-up, a blog and news on the latest cats who are in need of a new home. The new site is easy to navigate and instantly communicates what the services of the charity and clearly encourages action. The new website has already been a great success charity has already seen a growing interest in cats and kittens since the launch of the new website. If your company or organisation is in need of a new website, get in touch with CuCo today on 01202 911959 or email us at hello@cucocreative.co.uk – We’d love to help!